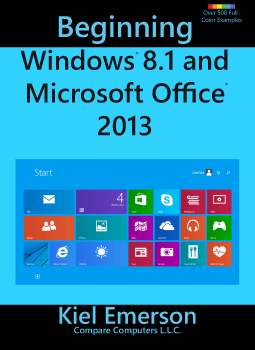 Beginning Windows 8.1 and Microsoft Office 2013 - Now Available! Compare Computers L.L.C. is proud to announce that our new book Beginning Windows 8.1 and Microsoft Office 2013 by Kiel Emerson, co-owner of Compare Computers L.L.C., is now available. Update 1 for Windows 8.1 is now available through Windows Update on computers running Windows 8.1. This is a mandatory update that is required in order for future updates to install. Update 1 adds a number of new features to the OS and improves the usability of Windows 8.1 on devices using a keyboard and mouse. Customers needing help installing the update can contact Compare Computers L.L.C. for assistance. Microsoft has introduced some significant changes to Windows 8 and Microsoft Office 2013. The Windows Start Screen, Charms Bar, and Modern UI Apps are only a few of the many new features. In the tutorial videos below, you will learn to use many of the new capabilities of Windows 8 and Office 2013. Copyright 2014 Compare Computers L.L.C.